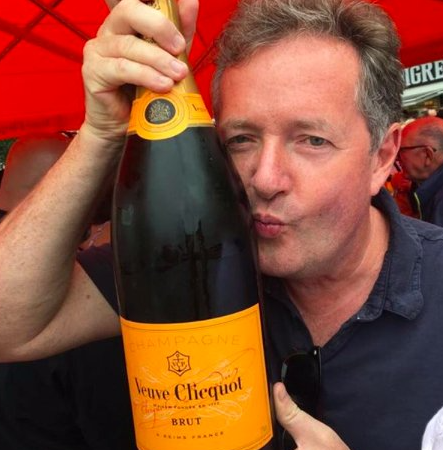 Vegan Champagne: Piers Morgan approved, (actually). Despite angrily typing “Vegan wine???!!! What fresh hell is this?!! !” followed by two vomiting emojis in response to a tweet by Taittinger advertising their vegan Champagne, it turns out that Piers Morgan is quite the fan. Product marketing manager for the London International Vintners Exchange (Liv-ex) and fellow Twitter user, Sarah Phillips, delved into Morgan’s Instagram only to discover that, actually, he seems to quite like vegan-friendly wine, especially of the sparkling variety. Perhaps a little counter-productive to his ‘vegan resistance’ movement, he has apparently been enjoying vegan-friendly wine all this time. So from Champagne to rosé, let’s take a closer look at the wines that Piers Morgan didn’t realise were vegan-friendly. Please stop giving this mediocre person a platform. Mr. Morgan touts misogyny, racism, and general contempt for anyone who does not think like him. We can do better than such “commentators”. That aside, I think there is an important underlying message here – that vegan wine is not a new thing, or a specially created product for the vegan market, like vegan sausages or something. There seems to have been a rapid shift from the position a few years ago, when it was widely, if wrongly, assumed that all wine was inherently vegan, to the view that vegan wine is somehow a category apart. It isn’t. Yup, this is exactly the point. None of those wines were vegan by design.